Distinctive due to their reddish hair and long arms, the name ‘orangutan’ directly translates from Malay to ‘person of the forest’. As the largest tree-living mammal, orangutans spend over 90% of their lives high up in the forest canopy. Wild orangutans are under threat from habitat loss due to logging, palm oil production, mining, and agricultural expansion. Deforestation is by far the most serious threat to orangutans and, over the last three decades, an estimated 80% of orangutan habitat has been lost. Funds from your adoption will support the Orangutan Foundation’s vital conservation work to protect Central Kalimantan and safeguard the future of the precious orangutans who live there. Your adoption will also support our campaign against the illegal trade in bushmeat, from apes and other threatened species, and our campaign in opposition of the live trade in apes. 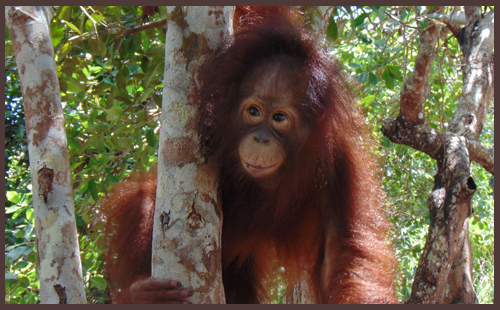 You can help protect wild orangutans by adopting Timtom below. "Every one of these cousins of ours, these people of the forest, is one of us. They are in great danger. All that can be done to save them must be done. Look into Timtom’s eyes. She needs you. So let’s do all we can. We owe her that. It’s we who have caused her and all orangutans so much harm. Let’s right our wrongs." Timtom was just a baby when she was taken from her mother and illegally kept as a pet. 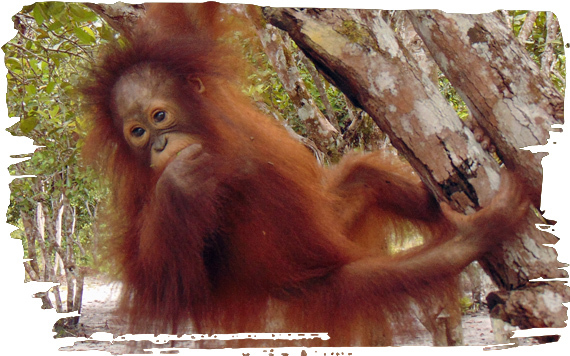 Timtom was rescued by Orangutan Foundation and now lives at Camp JL in Borneo. Help us protect wild orangutans.